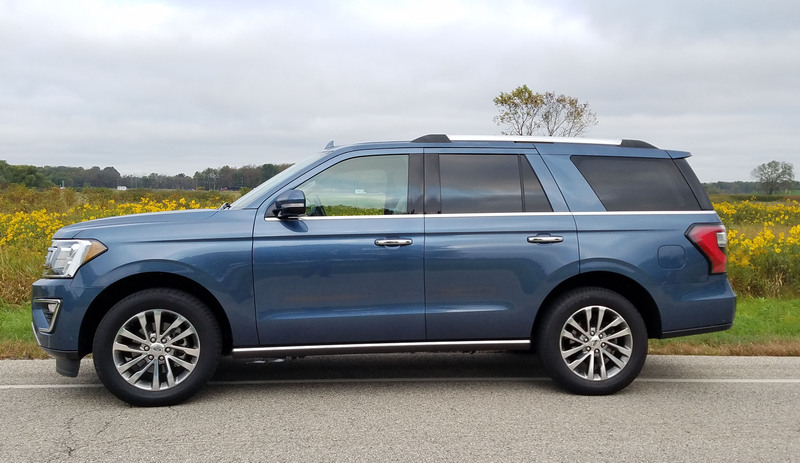 Big is big when it comes to large SUVs, but some drive better, are easier to handle and Ford has improved both in its new Expedition, a huge craft to be sure. But for 2018 the Expedition is all-new from the wheels up, and it shows. This was an enjoyable drive and perfect for a large family or someone hauling a bunch of folks regularly. First, it went on a diet, like Ford’s F150 pickups that now feature aluminum in the bodies. Ford says the new Expedition, which uses a generous amount of aluminum in its body, has shed 300 pounds compared with the 2017 model. That’s a lot. Expedition now uses only a 3.5-liter EcoBoost V6 instead of a V8 too. This twin-turbo V6 feels powerful with its 375 horsepower and mighty 470 ft.-lbs. of torque, but also delivers better gas mileage than past models, while still allowing the SUV to easily pull 9,300 lbs. Its new smooth-shifting 10-speed automatic transmission also works seamlessly and is well mated to the V6. 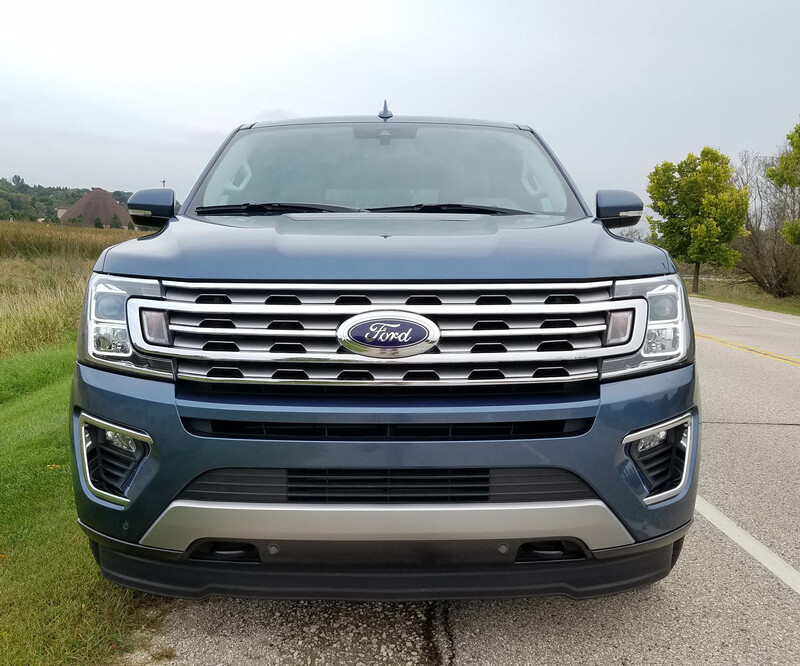 No one will mistake Expedition for a sport sedan, but it does feel more agile and less weighty on the road, and its tight turning circle, compared with other large utes, makes it easy to maneuver in a parking lot. I found this big boy easier to park than last week’s Acura RDX. Of course it’s a lot longer at 210 inches in length, but the rearview camera helps you see well enough to maneuver in tight spots. There’s an optional 360-degree camera available too, which would help even more. It wasn’t included on this test vehicle. But the tested metallic blue Expedition Limited was the middle trim level and included 4-wheel-drive, which costs about $3,100 extra on any of the three trims. There also are seven drive modes from muck and mud to comfort, so you can adjust the ride, and shifting to meet your current needs. That’s all handled with an easy-to-use dial on the console. 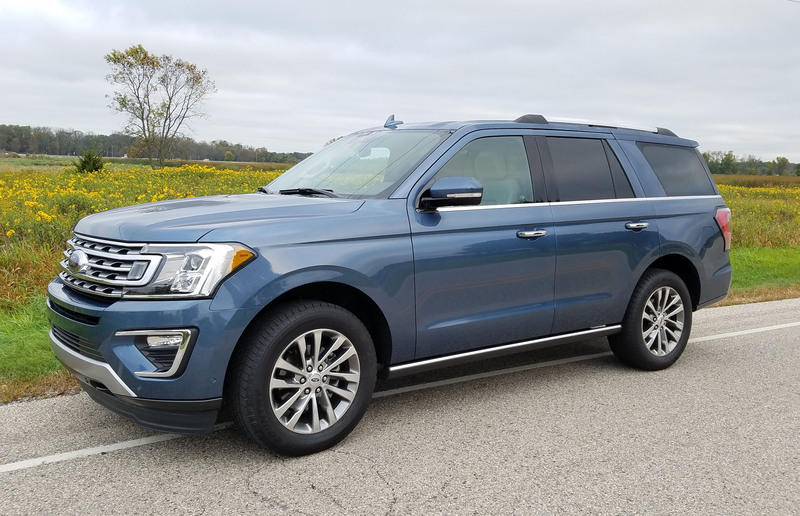 So power, handling and traction are big pluses for Expedition, and one would imagine most Wisconsinites and others from the northern tier of state will opt for AWD, even though it’s pricey. Ride is decent, but still trucklike. 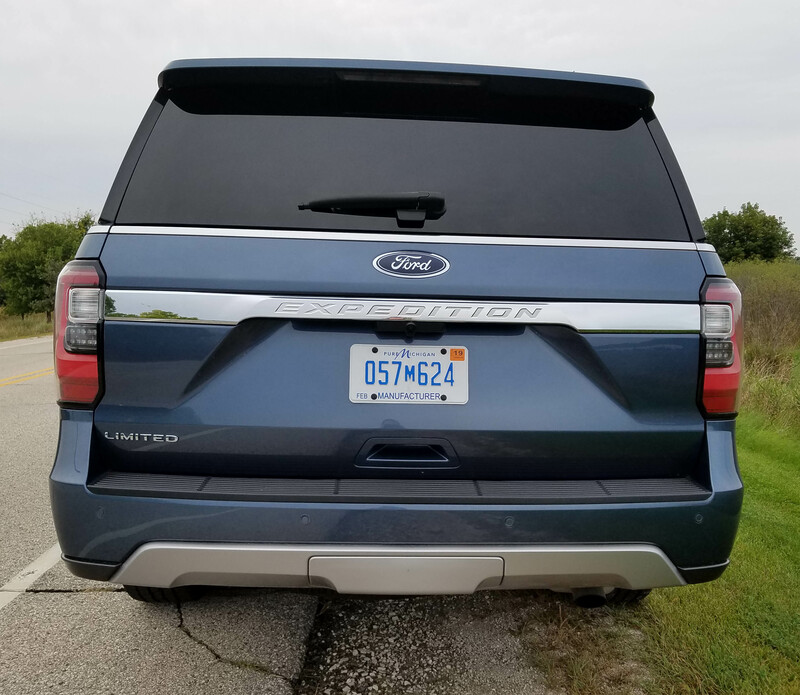 Ford uses an independent rear suspension on Expedition, which can helps it ride some better than the solid-axle designs such as Chevy’s Tahoe and other related GM trucks. But there’s still a truck feel that means the vehicle tends to rebound and sway over severe road bumps and pot holes. These don’t jar the truck, just make its body roll and sway a bit. Also, with more than 5,000-lbs. of weight and a tall stance, the truck leaned a bit in tight turns. The independent rear suspension also improves the Expedition’s cargo space as there’s less intrusion of the suspension in the cargo area. There’s a monster 104.6 cubic feet of cargo space in the Expedition’s tail end, when all the seats are folded flat. Plus a power hatch makes it easy to access the cargo area. The top-level Platinum edition includes a hands-free power hatch where you can wave a foot behind the car and activate the hatch. Beyond massive cargo room there’s oodles of passenger room too. With a bench in the second row and the power fold third row you could squeeze eight folks in an Expedition. Head and legroom are generous and that third row can be powered down by somewhat confusing buttons inside the hatch. Lots of cargo room and a third row seat for passengers too. Still, everyone who rode in the Expedition praised its quiet and comfort levels, and while it looks almost insurmountable to climb aboard, the test ute had electric running boards that powered down as a door was opened to give you a leg up for climbing aboard. Don’t know if those are impacted much by snow and slush and freezing slop along the vehicle’s lower quarter panel in winter, but they were flawless in a wet fall. 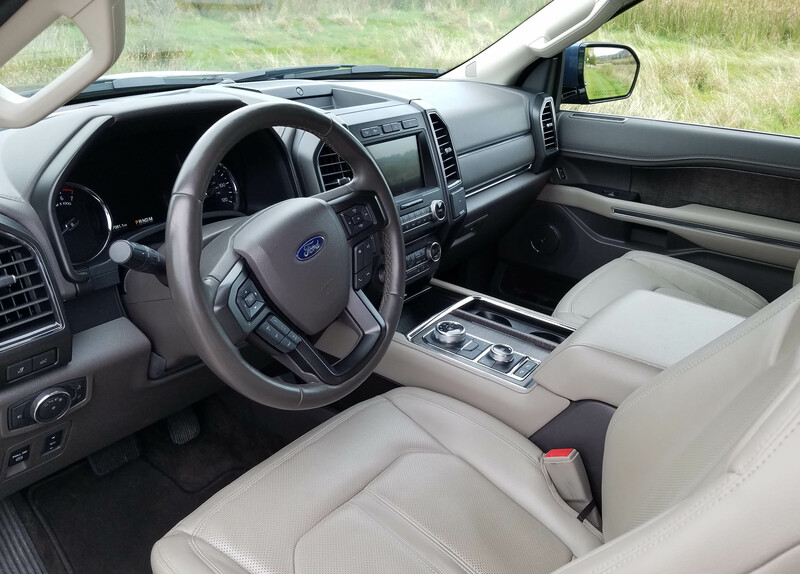 Inside the Expedition was comfy and luxurious with a tan and dark brown leather interior with leather on the dash, doors, arm rests and seats. Seats were tan, the dash dark brown with slim wood-look trim and chrome accents. Same with the doors and the fake wood also graced the console’s top. The well-cushioned leather seats were powered and heated and cooled up front, just heated in row two. All the seats provide good hip and back support and the driver’s seat had three memory settings. The dash is well laid out and easy to see and use, including large buttons and knobs that you don’t have to guess their function. Even six buttons for programming your favorite radio stations. Plus there’s a big touchscreen mid-dash that works well. 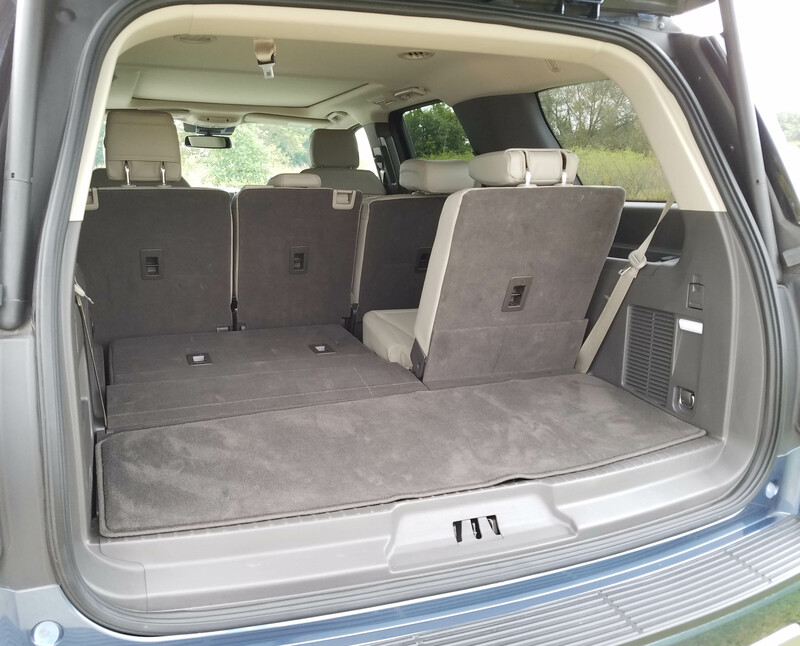 Expedition also features a huge storage box between the front seats with a well-padded armrest on top. You also can put down the third row’s headrests with the push of a dash button and there are plenty of electrical outlets throughout, plus a wireless phone charger under the center stack. Other pluses included a heated steering wheel and panoramic sunroof that helped light up the rear seat when the roof’s shade was open. The wheel itself is powered too, so easy to adjust in small increments even as you drive. The sunroof is part of a $3,030 option package No. 301A. It also includes a voice activation system for the navigation and touchscreen, smart cruise control with a gas-saving stop & go feature, lane-keeping assist and pre-collision assist with pedestrian recognition. A few little things to consider, the Expedition’s sun visors slide, there’s an open tray atop the dash and open coin holder on the dash to the driver’s side of the radio. And in case you missed them all, as I mentioned some of these earlier, the safety equipment list is extensive. In addition to the backup camera, cross-traffic alerts, lane-keeping, smart cruise, etc. There’s blind-spot warning and parking sensors. There’s one more feature here I didn’t try, for various reasons. That’s the enhanced active park assist, which costs $400. It will reportedly parallel park the vehicle for you and help it squeeze into tight spots. I parallel parked in a tight downtown spot on my own. As I said earlier, the Expedition handles well and maneuvers into tight spots like a smaller ute. 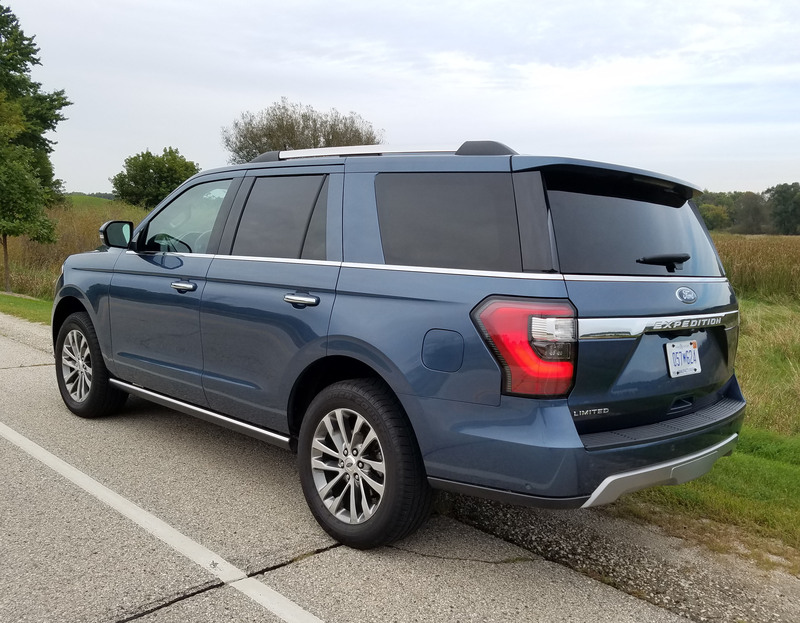 Then there’s the gas mileage improvement due to the Expedition’s weight loss, more fuel-efficient turbo V6 and stop & go system that turns off the engine when the car is at idle. I got an impressive 18.9 miles per gallon in about 60% city and suburban driving, including a jaunt through the many torn-up streets and detours of downtown Milwaukee. The EPA rates Expedition at 17 mpg city and 24 mpg highway. One can wish for more, but you won’t do better in other large SUVs. Pricing is high on all large utes and the Expedition is no exception. The base XLT starts at $52,985 for a 2-wheel-drive model. Add $3,100 or so for 4WD. This Limited started at $66,900, including delivery. After options it hit $70,155, including a $500 discount. Wanna go broke? I mean go for broke. Well, the Platinum model starts at $74,225. Plus there’s a longer wheelbase Expedition, the Expedition MAX. It’s nearly a foot longer with nearly 10-inch longer wheelbase and starts at $55,600, approaching roughly $80 grand at top end. The MAX also ups horsepower to 400 and torque to 480 while riding on 22-inch tires compared to 20-inchers on the standard Expedition. If only a large ute will do, Expedition is a fine choice. Hits: Large, carries 8 passengers, good power and decent gas mileage for its size, plus 7 drive modes. 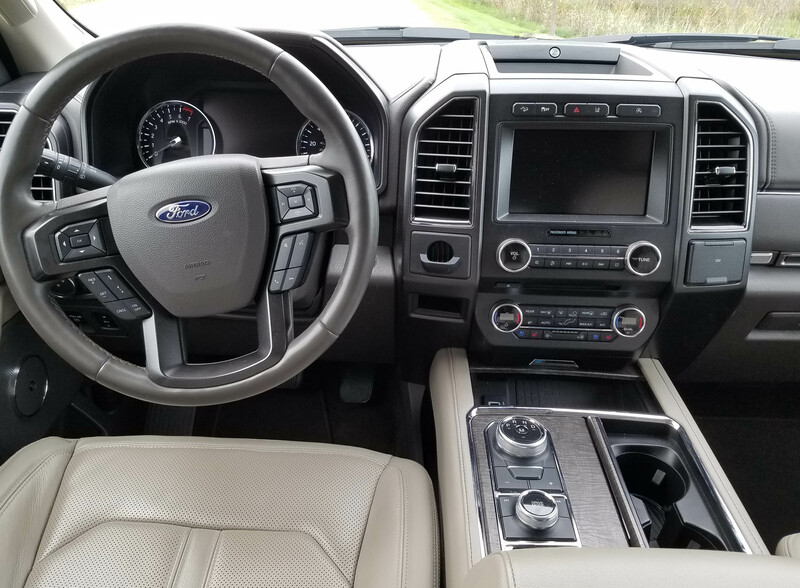 Comfy interior with big sunroof, heated/cooled seats, heated steering wheel, phone charger, big dash buttons and knobs, power tilt/telescope wheel, power running boards. Easy handling in parking lots. Misses: Still a trucklike ride and some lean in tight turns. Price.